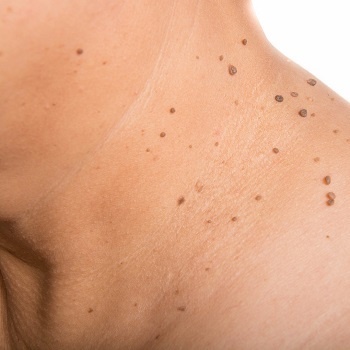 Melanoma is a form of skin cancer, usually identified by certain types of mole. It’s most commonly associated with exposing the skin to too much ultraviolet (UV) light. If it isn’t detected early, melanoma can spread to other organs in the body, so it’s vital to speak to a doctor as soon as you notice any changes in an existing mole, or suspicious-looking new moles. They will be able to assess you for any visible signs of a potential melanoma and recommend next steps that will ensure you are given the appropriate treatment as soon as possible. One short consultation could potentially save your life. The most common form of melanoma is known as Superficial Spreading Melanoma, which accounts for around 70 per cent of cases in the UK. Problems usually occur on the back, legs, arms or face, while some rarer forms of melanoma affect the soles of the feet, palms of the hands, the eyes and under the fingernails. Is asymmetrical, i.e. one side is a noticeably different shape. Does not have smooth, easily identifiable borders. Contains more than one colour, especially if patches of it have turned very dark brown, red or black. Measures more than six millimetres in diameter. Becomes enlarged, i.e. it covers a larger surface area or has become raised. It’s worth noting that these symptoms do not occur in a specific order and not all need to be present for it to be melanoma. You should also get yourself checked out if your mole starts to itch, bleed, crust over or becomes painful. When it comes to potential melanoma, you should never adopt a ‘wait and see’ approach. The safest option is always to consult a doctor. You are probably aware of the warnings that say prolonged exposure to sunlight increases your risk of melanoma and skin cancer. That’s because sunlight contains ultraviolet light that can be damaging to skin cells. It actually contains three types of UV light - A, B and C - and it’s the first two that cause problems for your skin. This is why the labelling on sun lotion bottles details the protection offered against both UVA and UVB. Inadequate sun cream, whether it’s not a high enough factor or simply hasn’t been applied properly, can increase the risk of melanoma. Sunburn is caused when skin cells are damaged by prolonged exposure to UV light. It can be very painful and uncomfortable at the time, but more seriously it also increases the risk of developing a melanoma in later life. Using sunbeds also puts you at an increased risk of melanoma, so much so that the government passed a law in 2010, making it illegal for under-18s to use them. They are just as dangerous as sitting out in the sun and there are plenty of studies to prove that using them to get a tan is simply not worth the risk. As with most cancers, studies are constantly being done to find ways to identify signs early and provide better treatment. Recent studies have found that there may be an increased risk of melanoma in people who are also suffering from conditions such as sarcoidosis and Crohn’s disease (IBD). This can be to do with the symptoms of these illnesses, or a side effect of the medication associated with them. Some research also indicates that men who are overweight are more likely to develop a melanoma. The melanoma is less than 1mm thick and hasn't broken the skin. The melanoma may be up to 2mm thick, or it may still be less than 1mm but it has broken the skin. The melanoma may be up to 4mm thick, or it may still be less than 2mm but it has broken the skin. The melanoma may be thicker than 4mm, or it may be less than 4mm but it has broken the skin. The melanoma is thicker than 4mm and it has broken te skin. 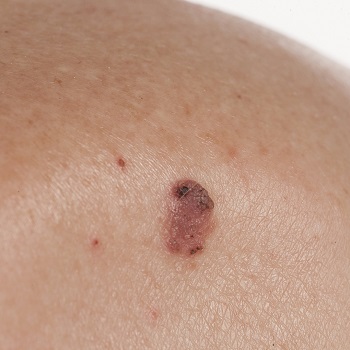 The melanoma has spread to up to three lymph nodes, but these are not visibly bigger. It hasn't broken the skin or spread to other areas of the body. The melanoma has broken the skin and spread to up to three lymph nodes, but these are not visibly bigger, OR the melanoma hasn't broken the skin, but it has spread to up to three lymph nodes and these are visibly bigger, OR the melanoma hasn't broken the skin, but it's starting to spread across your skin and lymphatic channels (although it hasn't reached any lymph nodes). 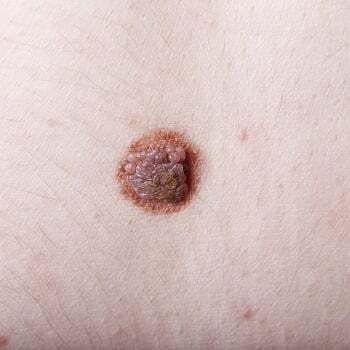 The melanoma has spread to your lymph nodes, skin and lymphatic channels, OR it has broken the skin and spread to up to three lymph nodes that are visibly bigger, OR it has spread to 4 or more lymph nodes and may or may not have broken the skin. The melanoma is at an advanced stage and may have spread beyond your lymph nodes, to area such as the brain, bones and lungs. The treatment for melanoma depends entirely on how early it’s identified. Generally, once a potential melanoma is identified, you will be sent for a biopsy to determine if the mole is cancerous. You will hear doctors talk about what is known as a ‘staging system’ to determine the appropriate treatment for your melanoma. This is used to outline how far the cancer has spread. For example, stage 0 is a melanoma that has been caught very early and not progressed beyond the surface of the skin. This can usually be surgically removed under local anaesthetic. In contrast, stage 4 is a melanoma that has spread to other areas of your body. This is the most serious form of melanoma and much more difficult to treat. In these cases, you might be offered treatments associated with many other types of cancer, such as radiotherapy or chemotherapy. The advantages of early detection are very clear. If you have any concerns, don’t wait for things to get worse. Talk to a doctor today.